As far as I’m concerned, Cardiacs were (and are) the greatest band that ever walked the Earth. The perfect combination of prog indulgence and complexity, punk energy and subversion and sublime pop melodies, the band led by the towering genius that is Tim Smith completely changed the way I thought about music. And, like virtually Cardiacs fans, I cherish them more than any other band I’ve ever heard. The obscenely talented Kavus Torabi, leader of the similarly brilliant Knifeworld – whose second album The Unravelling, is out now via Inside Out Records, and who are also nominated for a couple of Prog awards – joined Cardiacs on guitar in 2003 and remained a member until Tim Smith suffered a heart attack and stroke in June 2008 and the band’s activities fizzled to a distinctly tragic (but hopefully temporary) halt. As a result, Kavus is well placed to comment on some glittering highlights from Cardiacs’ unassailable catalogue of musical brilliance. I spoke to him about five of my favourite songs and asked him whether they conjured up any specific memories and, perhaps more importantly for those of us who obsess about such things, exactly how devilishly difficult the songs were to learn and play. Is This The Life The best-known Cardiacs song of them all, Is This The Life was a permanent fixture in the band’s set lists for over two decades. It was famously played on Radio 1 by an only slightly bewildered Steve Wright and was as close to a hit single as Cardiacs ever got. You can find it on both 1984’s cassette-only release _The Seaside _(since released on CD but fairly hard to track down!) and the classic 1988 album A Little Man And A House And The Whole World Window. R.E.S. Another track from A Little Man And A House And The Whole World Window, R.E.S. is a glorious example of Tim Smith’s ability to combine razor-sharp pop melodies with sinister, nursery rhyme insanity and mind-bending, prog-fuelled intricacy. Madder than a lorry full of boxes of frogs but still oddly beautiful, it almost certainly does, as Kavus explains, feature the greatest guitar solo of all time. Jibber And Twitch First released on The Seaside in 1984, this early Cardiacs classic is another dizzying eruption of crazed musical ideas, insidious hooks and twinkly-eyed macabre. Shortly after joining the band in 2003, Kavus had to learn Jibber And Twitch, along with a ludicrous number of other songs from the early Cardiacs years, for three special shows the band performed at The Garage in London in October of the same year. Those shows are captured on The Special Garage Concerts Volumes I and II albums. 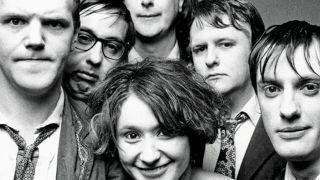 Dirty Boy In 1996, Cardiacs released a double album entitled Sing To God. An audacious and ambitious 90 minutes of pure Tim Smith genius, it is an album that encapsulates the overwhelming magic and majesty of the band’s sound, with a wonderfully vivid and powerful production that Cardiacs never quite equalled on their other recordings. The greatest song on an album full of great songs, Dirty Boy is nine-minutes of dark, monumental and lavish psychedelia. There is nothing else quite like it. Ditzy Scene Recorded shortly before the last tour Cardiacs did before Tim became ill, Ditzy Scene was the first song to be committed to tape by the Kavus-era line-up. It was released as a limited edition single by those splendid people at Org Records and offers a tantalising glimpse of what the band’s proposed next album, tentatively known as LSD, might have had in store for Cardiacs’ army of devotees. Vocals aside, Tim Smith had recorded most of the album when he fell foul of ill health but, as yet, the songs remain hidden in some dusty but magical vault somewhere. We can only hope that Tim recovers and completes the job very soon.